Now the focus of the piece was people dropping out of record books or surnames disappearing into a sea of married daughters. But looking at it from a DNA perspective, the only possible answer is — how could you not have secret relatives? Let’s face it: reproductive patterns being what they were, and advances in DNA technology being what we’ve seen just in the past few years, every last one of us is likely to have cadres of cousins — regiments of relatives — out there waiting to be found. At least I for one sure hope so. So just how many matches could you realistically be talking about, if every one of these cousins got tested? If you begin with your third great grandparents and calculate down to your generation (the fourth cousins), and if you figure an average of two children per generation (that’s two who survived and went on to produce two more who survived and had two more, etc. ), there would be 32 cousins — most of them fourth cousins to you — in your generation. But my mother’s family was made up mostly of farmers from the U.S. south. There, the idea of two kids would have the old folks shaking their heads and the young ones tsk-ing about the blood thinning. So let’s say there were three children on average produced by each generation starting with the third great grandparents. Now you’re talking 243 cousins at the 4th cousin level. And if each generation produced an average of four kids, there’d be more than 1,000 fourth cousins — and roughly 500 of them would share enough DNA with you to show up as matches in an autosomal DNA test. See? Scores of secret relatives — secret because you haven’t met them. And today I have fingers, toes and even eyes crossed that one of those secrets is about to come out and play in the sunshine. Notes taken by a cousin in an interview of my grandmother, Eula’s oldest child, say that Eula’s father was Jasper Baird, son of “Billy” Baird,5 and there is in fact a William Baird family on the 1860 Cherokee County census with a son Jasper of an age to have been Eula’s father.6 It doesn’t quite match up to the 1870 census, but it’s close, and there aren’t any other Baird-Beard-Biard candidates anywhere in the region. William and Christian Baird had moved their family to Pope County, Arkansas, by 1870, but their son Jasper wasn’t enumerated with them there,7 so their Jasper Baird is a good candidate to be my Jasper Baird. The family story is that Jasper went out one day with the wagon to get supplies and was ambushed by Indians. The wagon was found; his body never was. The fact that the last recorded Indian attack in Alabama was decades earlier apparently didn’t factor into the family accounts. So… was there another Jasper Baird in Cherokee County, Alabama, who was Eula’s father? Or was Jasper Baird, son of William and Christian, the father and, perhaps, never married to Martha? Or perhaps there was a divorce? An abandonment? Perhaps he was the father and never even knew it. And, of course, perhaps he was named as the father to the nosy assistant marshal who took the census in 1870, and wasn’t the father at all. 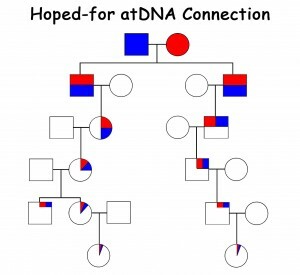 And then along came autosomal DNA testing. For the first time, it became possible to test across gender lines. And, just this week, we have a descendant of William and Christian Baird to test up against Eula’s descendants. So — if we’re right that our Jasper was William and Christian’s Jasper and if we’re right that Connie’s J.D. Baird was William and Christian’s Jefferson D. — Connie would be my fourth cousin (50% chance of a match) and a third cousin once removed to four older relatives who descend from Eula (about 65% chance of a match). That’s why the odds of a match keep going down. As explained by Blaine Bettinger of The Genetic Genealogist, we have both a genealogical family tree and a genetic family tree — and not everybody in our genealogical family tree is in our genetic family tree.23 It’s entirely possible that we could be related to Connie in the Baird line, and yet not show up as a match at all. But here’s hoping … maybe, just maybe, this secret will be secret no more with this DNA test. Interesting post..as usual, Judy! .my quuestion for you concerns the statistic that first cousins share 12.5 % DNA. I would think that “double” first cousins share a greater percentage. Do they? Thanks in advance! They certainly could share more, Noreen, and in fact these percentages are just averages anyway. There’s a pretty wide range of percentages within each of those categories once you get past the parent-child stage. Thanks, Celia… and oh yeah… George is my nemesis for sure. What Celia said 🙂 … Can’t wait to hear how it all works out! Also can’t wait till your webinar Wednesday! Don’t you have to research Connie’s entire ancestry for this to work? If you match how do you know it is the Bairds that are ancestral unless you have researched all of Connie’s third great-grandparents and eliminated them from your own family tree? Unless you know all 32 full names, how can you be sure that she isn’t a Cottrell and thereby throwing your identification into doubt? Likewise don’t you need to know all your 32 third great grandparents and eliminate them from Connie’s ancestry. What if Connie descends from a Smith and your George Washington Cottrell’s mother was a Smith and that’s the connection? It seems to me that DNA genealogy only works if you can eliminate all the other possibilities. You’re right that we would have to know more than just the chances that these two Baird lines intersect and yes, absolutely, DNA has to work hand-in-hand with paper-trail genealogy. It won’t take the place of it, it simply helps out. We’re fortunate to have enough persons tested from enough lines to be able to greatly reduce the chances that a match would be misinterpreted. 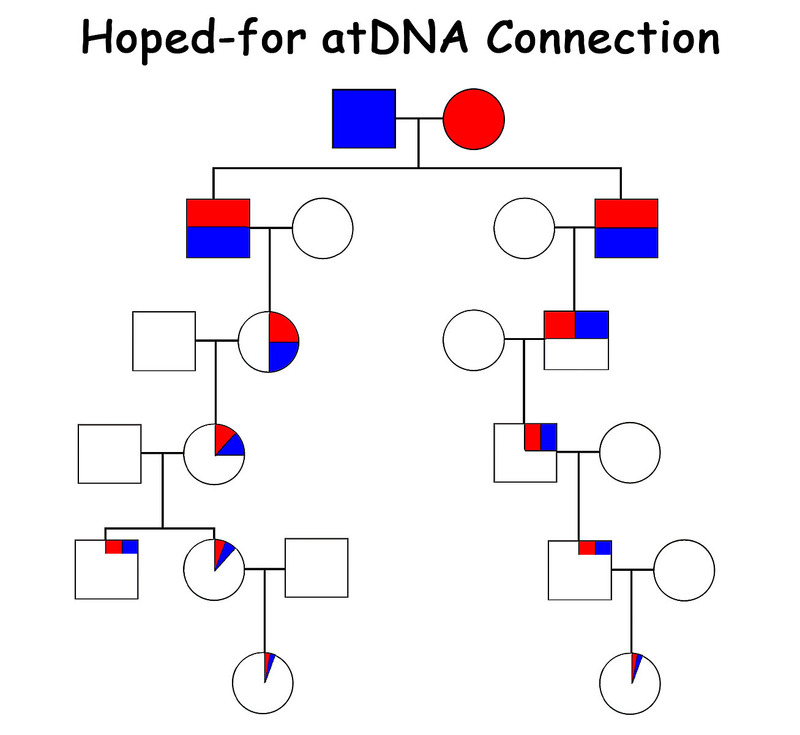 Very cool example of my favorite application for autosomal DNA testing for genealogy – testing out a theory. I look forward to hearing the result. BTW, where did you get the 65% figure for the odds of matching a third cousins once removed? I would estimate it is a little higher than that based on my own research.